POSTED Mon, 08/11/2014 - 05:00 | POSTED BY Traci C.
The Walt Disney Company recently announced the fiscal third quarter earnings report, but perhaps more interesting than the numbers was the Star Wars news mentioned during the conference call. Let's talk about the fiscal report first. The company's Parks and Resorts division had another successful quarter with an 8 percent increase in revenue to $4 billion and a 23 percent increase in operating income to $848 million. 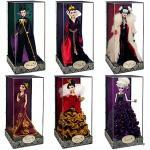 POSTED Sat, 04/26/2014 - 05:00 | POSTED BY Traci C.
Maleficent might be one of the most stylishly frightening Disney villains around, and the merchandise set to arrive in stores before the film's release reflects that. Some of the merchandise inspired by the film includes Italian-made scarves, jewelry, and even a kids' collection from designers Stella McCartney. POSTED Fri, 03/28/2014 - 05:00 | POSTED BY Traci C.
Disney's Maleficent is set to open in theaters at the end of May, but Disney Parks guests have a chance to see an extended sneak peek starting April 18. The film stars Angelina Jolie as Maleficent, one of Disney's most iconic villains. The film explores the betrayal that turns her heart to stone. As we know from Sleeping Beauty, Maleficent places an irrevocable curse upon Princess Aurora, and in the film Aurora finds herself in the middle of a conflict between the forest kingdom and the human kingdom. POSTED Fri, 01/24/2014 - 06:00 | POSTED BY Traci C.
There are still a couple of months until the 'Disney Festival of Fantasy Parade' debuts at the Magic Kingdom, and Disney recently announced a new float for the parade. 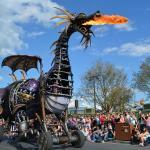 The float will represent Sleeping Beauty's Maleficent as a 35-foot-long, 26-foot high Steampunk-inspired dragon. The Disney Festival of Fantasy Parade is celebration of Fantasyland and each float will be created so that it appears as though the characters featured on the floats had a hand in creating them. The crowds went crazy Friday when the Maleficent Float made her return to the Magic Kingdom's Festival of Fantasy Parade after an extended absence. Maleficent hadn't been seen on the parade route since she caught fire during the May 11th 2018 performance, doing some serious damage to her structure. High Drama, High Fashion, High Spirited... this isn't your daughter's Disney stuff. Introducing the highly anticipated Disney Villains Designer Collection. Six of Disney's most notorious villainesses have been brought together in this special limited edition collection.